Finally, the campaigning is over, everyone knows more about fruit flies than they ever wanted to (thank you Sarah Palin), and on an historic day America has “voted for change.” As the country looks forward to a radical change in leadership, the coming weeks are going to be wall-to-wall analysis of what an Obama administration will mean for everything from the economy to energy. And 2020science.org will be there in the thick of things. But after a heavy night of vote-watching, I thought something a little lighter was in order. Whoever would have thought a science juggling act could be so much fun? Or so informative? 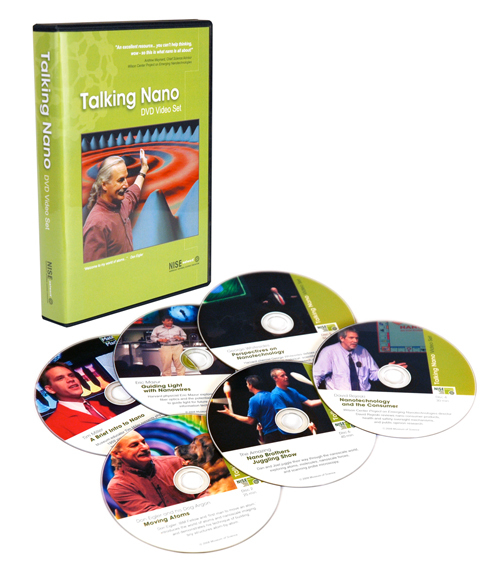 Yet a couple of weeks back I found myself grinning like a ten year-old as I sat reviewing a new set of nanotech DVDs. The culprit: “The Amazing Nano Brothers Juggling Show;” one of the highlights of Talking Nano-a just-released set of six professionally produced educational DVDs on nanotechnology from the Nanoscale Informal Science and Engineering (NISE) Network. Is nanotechnology suffering from “silent rave” syndrome? The silent rave might seem a rather bizarre social phenomenon; a group of strangers converging in a public place and dancing to their own individual iPod soundtracks. But I have a sneaking suspicion that the emerging technology community has been indulging in the new tech-equivalent of silent raves for some time now. Here’s a small diversion for a slow Sunday afternoon: Take sixty jellybeans and ninety cocktail sticks, and try to construct a model of a buckyball—a carbon-60 molecule. It’s tricky, but not impossible.